What is your skin concern? Acne? Wrinkles? Dark spots? For years, acne was my main skin struggle. I started getting facials when my breakouts first erupted. I found that it really helped control my skin. 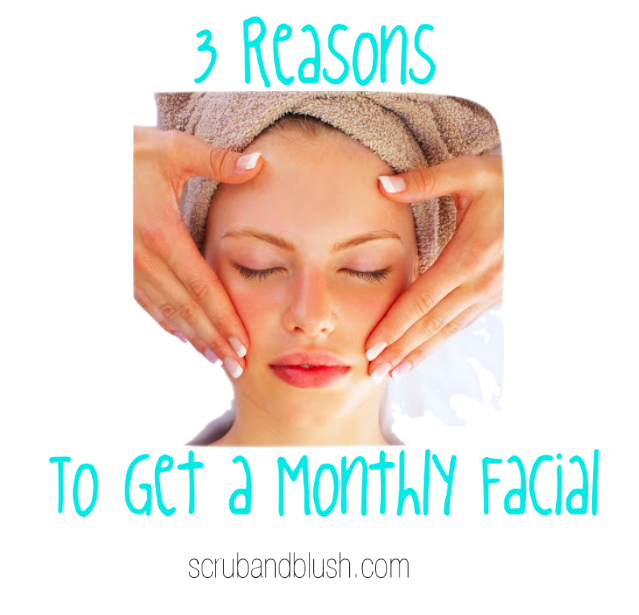 So why should YOU get a facial monthly? 1) Facials increase blood circulation under the skin by massaging and can prevent aging. Estheticians are skin care experts. They know what products to use and how to use them. They know how to massage the skin properly that can stimulate your skin cells and allow skin rejuvination to take place. Think of a facial as a skin booster. 2) A monthly consultation from your estitician of what habits and products you should be using on your skin for improvement. The more you build a relationship with the esthetician, the more she will not only get to know you but your skin. Overtime, she will know what to expect and can give you extra customary advice. 3) Extractions cannot only help your acne, clogged pores, blackheads, whiteheads and shrink pores, but also it will allow whatever skin care products you apply to your face to penetrate deeper, therefore, making them even more effective. Extractions can do what your scrubs at home can't. Never had extractions? Bascially, the esthetician will first open of the pores with a steamer and then put a bright light on your face you see what you may not see at home. Then they will remove any clogged pores one by one with a specialized skin care needle. They're kind of painful but it is the most effective step in a facial. Just be careful to never try this yourself or anyone else who is not properly trained. It will cause even more damage to the skin. Take it from me! After extractions, your skin will usually take two to three days for the inflammation and redness to go down. So if you're planning on getting one before a special occation, get it a few days in advance. Bottom line is, if you're going to get one spa treatment in your lifetime, get a facial. It will be 100% worth it. Not all facials are super expensive. You can actually get some facials that are not long and are a decent price. The past two facial appointments have been at face it! Med Spa in Kingwood, TX. If anyone is in the Houston area, I highly recommend this spa. I love all of the staff because they are always polite and very helpful. I used to be nervous with extractions but the estheticians at face it are very well trained and give you estractions that are not painful. While I was there, they gave me tons of samples of the skin care line they carry which I LOVE (in depth post TBA) and they have other skin care or makeup tools there to purchase so you don't have to make a trip to the busy mall. Face it has so much to offer other than facials like lasers and injections. If you want more information on face it Med Spa click here to go to their official website.